Back in July, the Queen in one of my bees asked for string blocks. I had so much making hers that I kept my string bucket out and just kept making blocks. 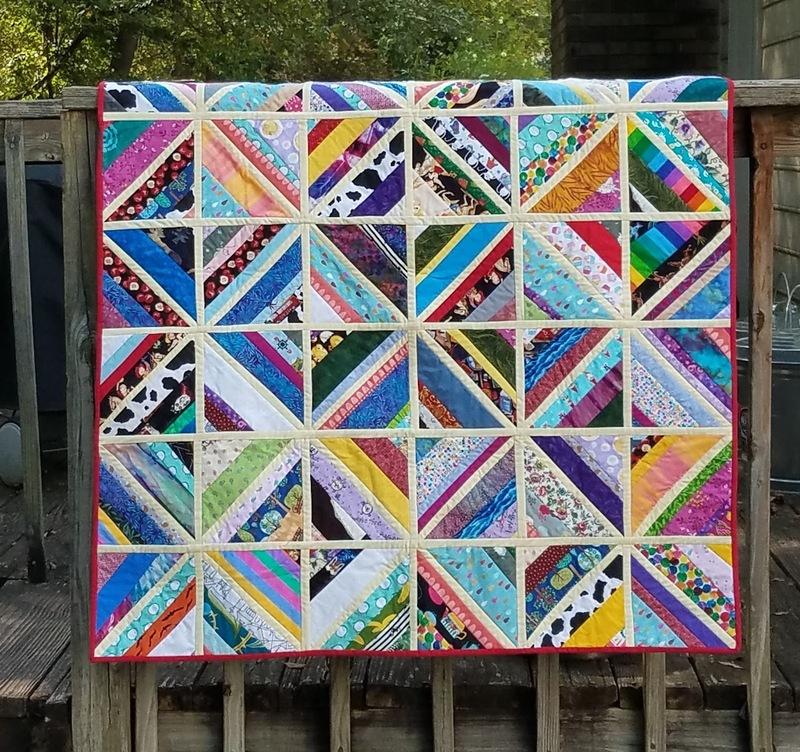 I decided to really go after scraps and did this as my very first Quilt As You Go project. In addition to the scrappy strings, I used up batting scraps. I love using fusible tape to make larger pieces out of batting scraps. I also used fabric donated to my Project Linus chapter for the backing. After sewing each block, at which time I also quilted it (!) I trimmed to 7 1/2". 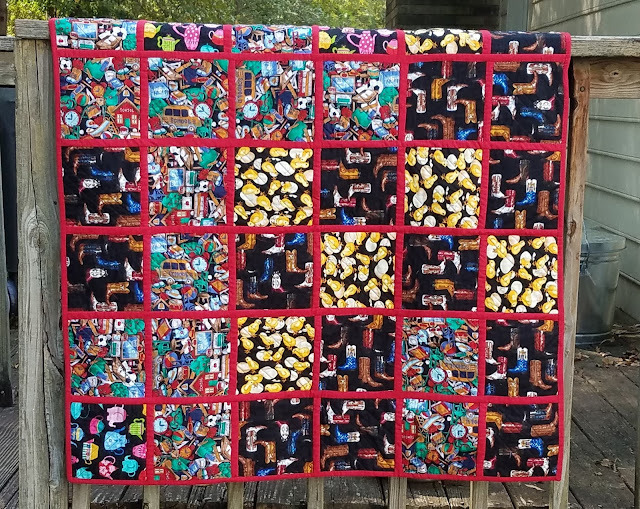 Turns out that I love Quilt As You Go! (QAYG) Having the quilting done once the piecing is done just feels so good! I used a method for joining the quilted blocks that I learned from the Craftsy class Quilting Big Projects on a Small Machine with Ann Peterson. One thing I will do differently next time is use non-directional prints for the backing. For this quilt, it got too hard to try to get the prints to face one direction so I just decided it didn't matter. The sashing on the blocks is some leftover Kona Meringue. Last time I made a string quilt, I was sorry I didn't use the same fabric in the middle of each block to give some continuity and order. I used the Meringue this time, but didn't think about how the joining method would mean each block was outlined. So there are a few more lines than I planned. Next time, I'll use the same fabric in each block if it's not QAYG and will skip it if I'm doing QAYG. 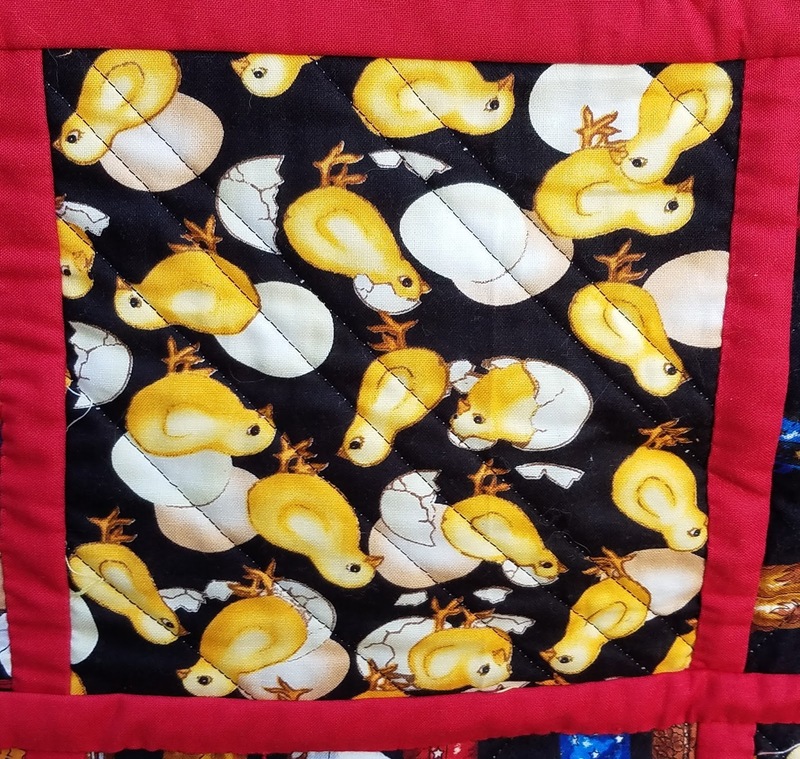 The string quilt was item #4 on my list of Q3 goals for the globally hosted finish along. I have never done QAYG, thanks for the tips! What a fun quilt! And things going in different directions on the back doesn't bother me at all! String quilts are fun and I'll bet it didn't deplete your string scraps nearly as much as you thought it might. Lovely finish! On behalf of the 2017 global FAL hosts, thank you for participating in this quarter's finish along. Love all the colours together!